As we change from flip-flops and tank tops to boots and cardigans, our home should also transition into autumn. Can you sense it yet? There’s a crisp edge in the air, the slight change in the color of the leaves, and the slow but sure approach of sweater weather. 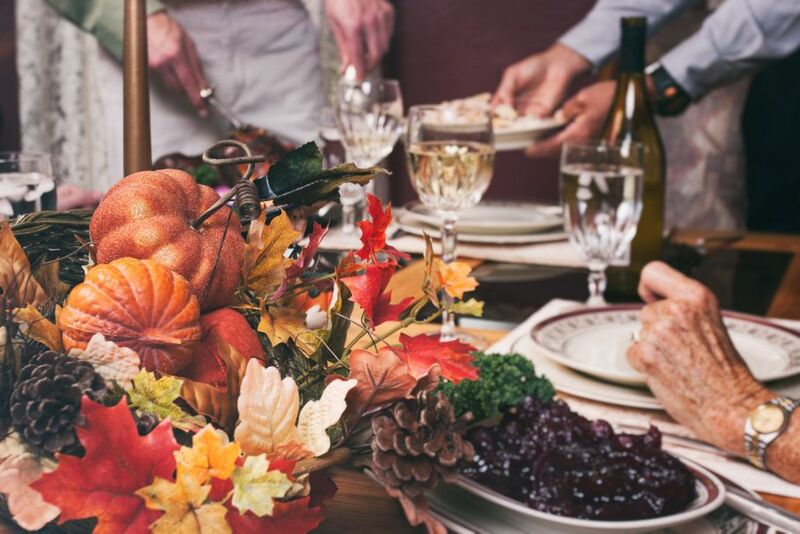 The fall season is well upon us, and just as we make the transition from flip-flops and tank tops to boots and cardigans, our home should also transition into an autumn oasis. Now, giving our home a fall focus means more than just adjusting the thermostat. It’s time to swap out your coconut candles and beachy-print dish towels for something a bit warmer. It’s time to spice up the home (we mean that both figuratively and literally) for autumn. Scented candles are a multidimensional decoration in that they illuminate both our senses of sight and smell. 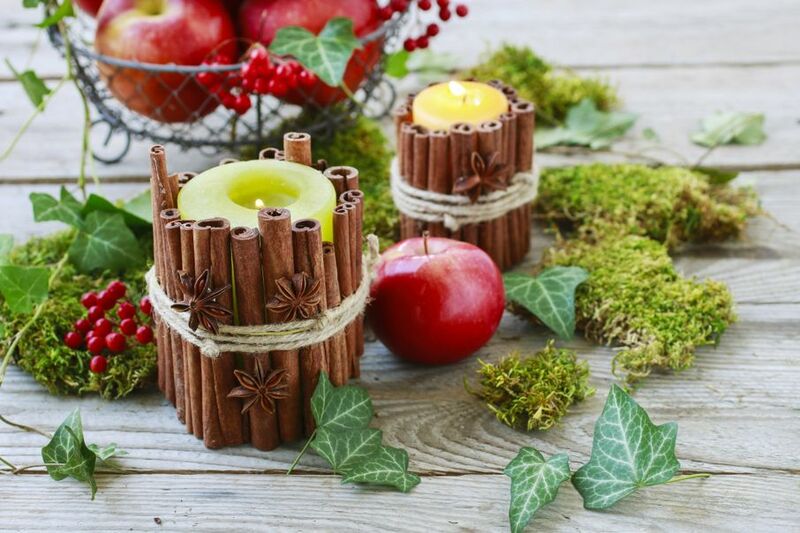 There is no quicker way to get your guests in the fall mood than to greet them at your home with delicious, warm scents and colors of pumpkin, spice, and apple. Fall-centric scent profiles match well together, too, so you can group a set of two or three candle jars as one, decorative piece. Tip: Gather three different candle scents, such as pumpkin (orange), apple (red), and autumn leaves (yellow), in three different sized jars. The color and height variance will create a beautiful setup that is easy on the eyes, rather than messy looking! Does cat, kid, or puppy scream, “No fall candles for you!”? No problem! 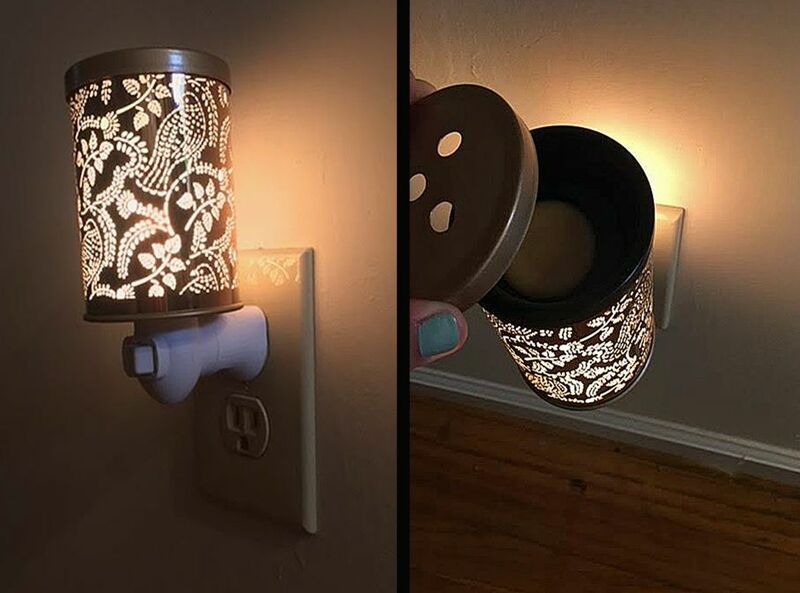 Decorative scent-diffusing plug-in lights add both scent and warm lighting to your home. As pictured above, this AmbiEscents plug-in wax warmer uses a tea light to heat a pot at the top of the cylinder. In that pot you can place scented wax cubes that will melt down and fill your home with lovely scents. In the fall, we love ‘Pumpkin Pickin’ Fragrance Wax Cubes. The cylinder holder also casts a warm, yellow light through its decorative, jack-o’-lantern-like pattern, which is why it’s the perfectly subtle autumn décor addition for any room in your house. Pumpkins, Gourds, Corn - Oh My! Leaving pumpkins outside for the squirrels to feast on is always an option, but how about bringing some of your fall-favorite veggies inside for a change? Liven up a fireplace mantle or empty windowsill with a cornucopia of living pumpkins, gourds, dried corn cobs, and pinecones. Without even you realizing it, perhaps, these little accents tie in all of the autumn feels – oranges, reds, greens, whites, along with plump textures and cozy associations. 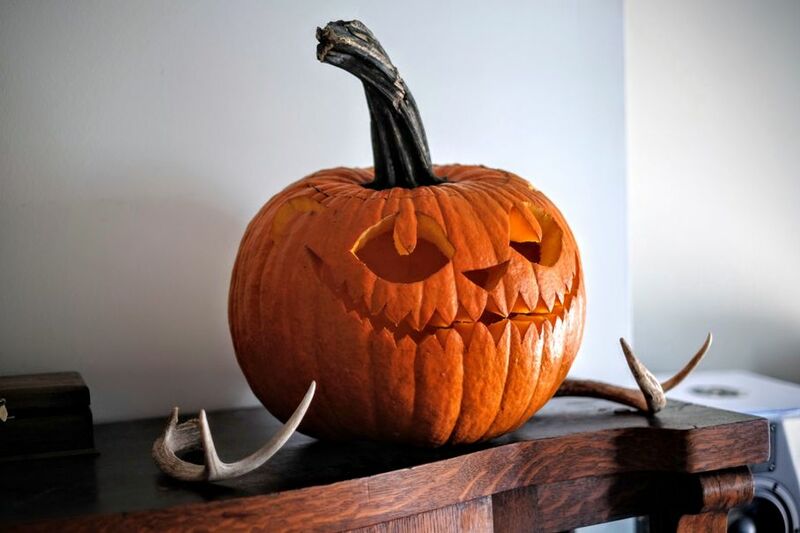 Pumpkins, especially, offer plenty of decorating flexibility, as they are available in a plethora of shapes and sizes. Fill up a decorative wire bowl with mini pumpkins (available at the supermarket), line each step of your stairway with medium rounds, or fill an unused fireplace with color using pumpkins, as we’ve pictured above. Fill your home with all of the fall feels using simple harvest accents straight from the farm! Leaves are so symbolic of the changing of the seasons, and we love to tie them in to our fall home décor. Right now, we’re focusing on the dining-room table centerpiece. Tie the warm fall colors and the cozy autumn feel in on your dining room table with a simple centerpiece like the one above. Head to your local craft store to pick up some decorative leaves, pinecones and acorns, glittery pumpkins, and candles. We recommend using the candles just as a showpiece since the surrounding decorations are flammable. Simply adorn a small wicker basket with your decorations, arranging them however you see fit and placing your candle in the middle. Viola! You now have a fall centerpiece that brings the changing season indoors and to your dining-room table! Who said wreaths are just for the winter season? Adding a colorful, autumn wreath to your front door allows your guests to be greeted with warmth before they even step foot in your home. 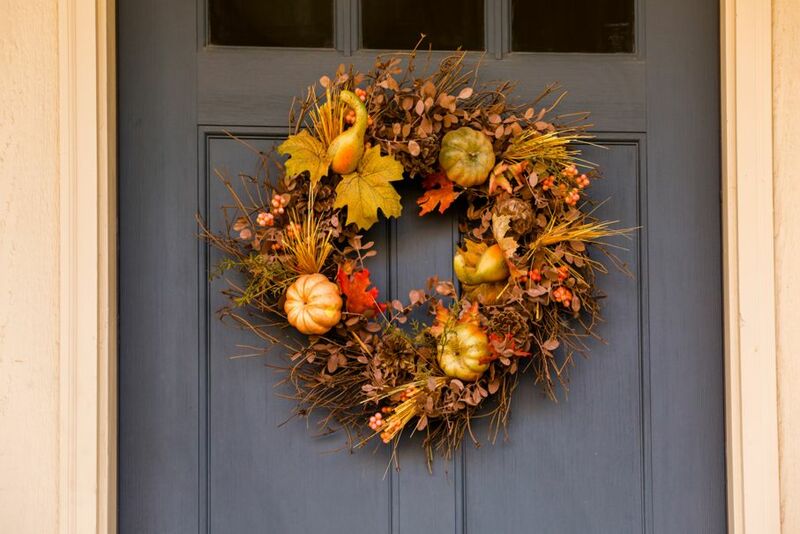 And with wreath popularity on the rise these days, more and more fall-themed pieces are available on the market, like this gorgeous option from Pottery Barn. Wicker furniture is created using a variety of plants, grasses, creepers, and thin tree branches –woven together to produce a piece that is both sturdy and gentle to the touch. Wicker furniture gives off a very earthy and soft feel, with country tones. 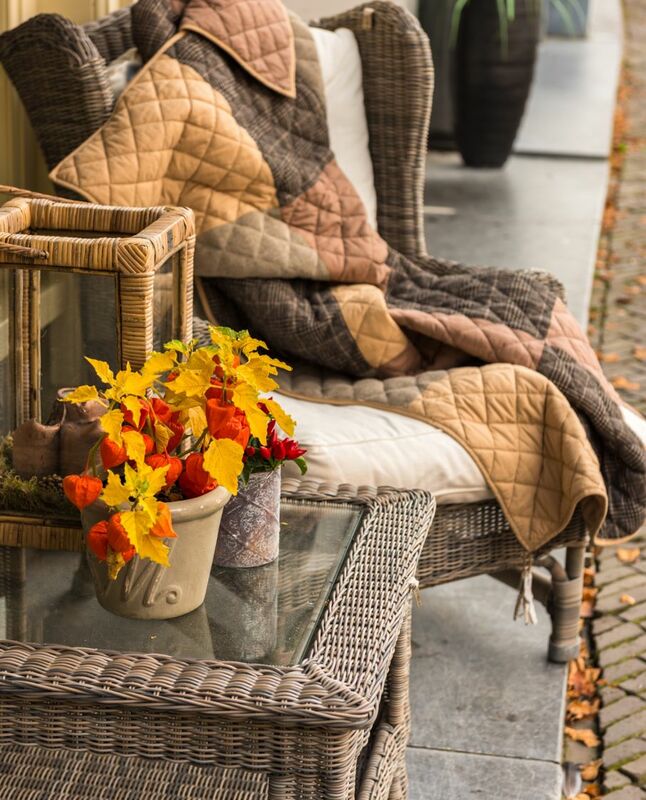 Add extra touches of fall to the home by swapping out some of your furniture, such as sitting chairs or an end table, with a piece of wicker furniture. Instantly, your home will feel more in tune with the outdoors, the hues of the changing season, and the warmth of it all. Fall decorating does not have to be centered on Halloween in October and Thanksgiving in November. Extend the lifespan of your fall décor all season long by integrating the rich colors of autumn into small, delicate touches around your home. Reds, oranges, yellows, tans, and browns – the hues of autumn instantly warm the senses and space for both you and your guests. As the temperature drops and the chill in the air thickens, be sure to cozy up your home with theses warm and inviting accents!